Last night’s Teen Wolf, “Visionary,” was absolutely full of enlightening exposition that answered plenty of key questions whilst also setting up the next step in the gradually unfolding Druid/Alphas saga. 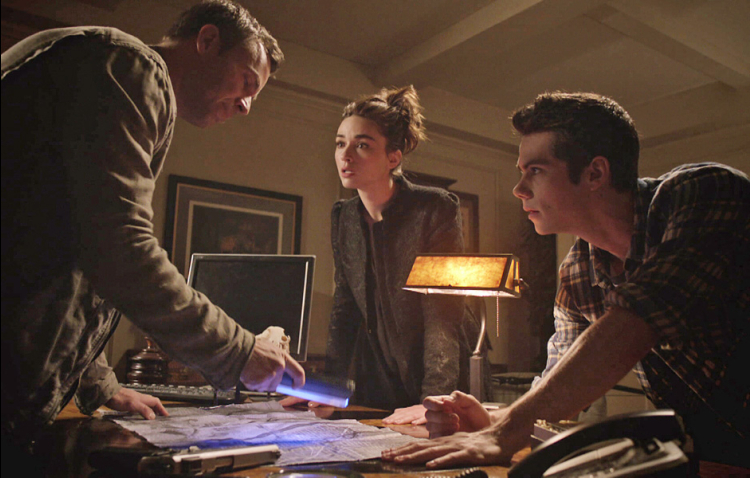 As Scott and Allison questioned Gerard Argent for information about the Deucalion, Stiles and Cora simultaneously quizzed Peter Hale on Derek’s personality (after Derek disappeared to grieve over Boyd), beginning with the moment(s) that changed him into the broody, blue-eyed werewolf he is today. By throwing in flashbacks to Derek’s high school years, “Visionary” managed to avoid being a snooze-worthy episode full of talk and no action–Derek’s past was not only interesting (thanks to decently-cast actors as young Derek and his lady-love, Paige, though Peter’s younger self was a bit of a miscast), but also genuinely touching and tragic. Allison took Scott to Gerard’s, who, in exchange for answers, wanted Scott to use his nifty pain-sucking trick; Scott obliged, and, after a bit of hem-hawing and Allison threatening to leave, Gerard finally launched into his story. Across town, Peter began his own story that nicely complimented Gerard’s, because both involved the period of time when a handful of wolf packs were running around Beacon Hills. In both stories, Gerard and Mr. Argent were hunting the Alphas, who were still split into three separate packs: the Deucalion (not yet blinded) headed one, while Barefooted Psychopath and Ennis headed the others. Seeking guidance on how to proceed against the hunters (after the hunters shot an arrow through the neck of one wolf, and then hung him from the ceiling of an abandoned building before slicing him in half), the trio of wolf packs waited for none other than Talia Hale, Derek’s mother, who was respected by the others because of her unique shifting abilities. Meanwhile, a cocky young Derek Hale was falling in love with violinist Paige. But, as their relationship grew more serious, Derek fell into brooding over how he’d keep the secret of his lycanthropy from her. With the help of an all-too-eager Peter, Derek decided he’d turn his girlfriend into a wolf as well. He needed an Alpha to do the biting, and Peter decided to sic Ennis on the poor girl. Tragedy struck after Paige was bitten–turns out, not everyone can handle the werewolf curse/gift. Derek took his dying girlfriend to the base of a ritualistic Druid tree (more on that in a minute), and, to put her out of her misery, Derek killed her himself. As a result of killing an innocent, his golden eyes turned bright blue. Truly sad stuff–though Cora and Stiles did question the accuracy of Peter’s retelling after realizing they were only hearing one side of the story. I’m sure we’ll be hearing Derek’s side soon enough. Back to that Druid tree. Gerard and Mr. Argent stumbled across the site of a Druid meeting place and discovered markings (and blood) on the base of an old, giant tree. Mr. Argent realized the symbols on the tree meant the werewolf packs were receiving guidance from some Druid emissaries. (According to Gerard, the very first werewolves were brought into creation by some angry Gods and a group of Druids who taught the wolves how to shift into human form.) In an awesome reveal, Gerard told Scott and Allison that Deaton and his guidance counselor sister were the emissaries in question–though Deaton’s put that past behind him, his sister is still the Druidic adviser to the current Alpha pack wreaking havoc on Beacon Hills. Lastly, the story of the Deucalion’s present-day blindness. Gerard was ambushed inside the abandoned building where the wolf had been severed by the hunters. Of course, Gerard was prepared–he turned on the steam to distract/hinder the wolves, then whipped out a terrifying homemade weapon that was essentially a wooden club lined with spikes. As he clubbed away at several wolves, the Deucalion managed to slip outside. 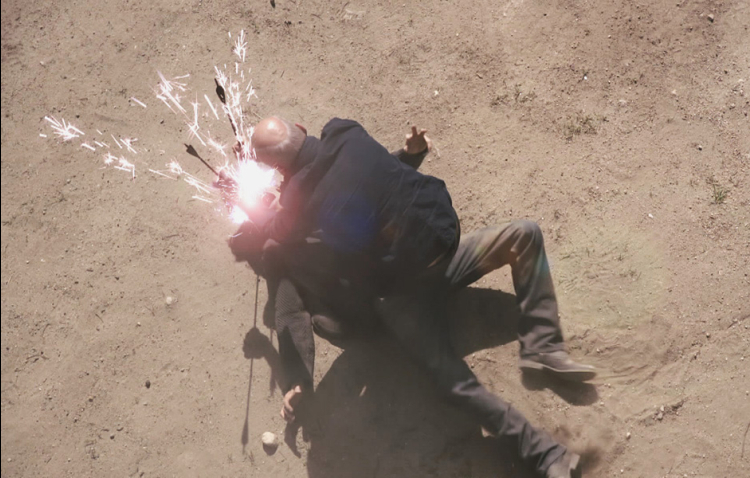 Unfortunately, Gerard caught up to him, held up two of those arrows Allison loves (the ones that emit electrical shocks or fire–something violent, anyway), and stabbed them into the Deucalion’s eyes. 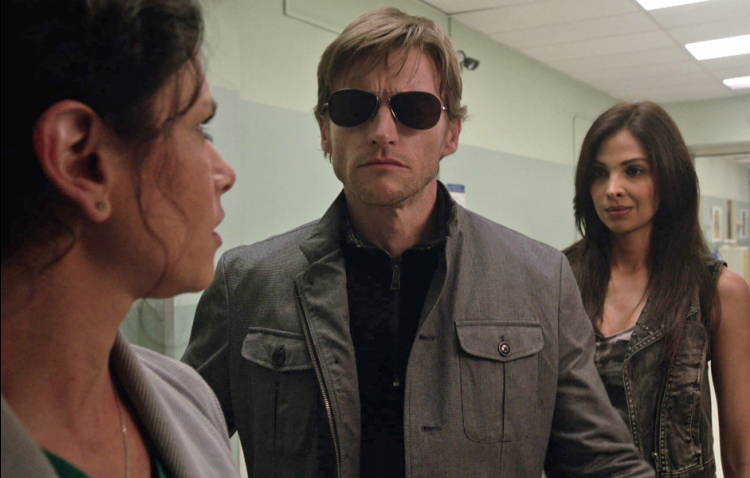 When the injured Deucalion ran to Deaton, the vet/Druid adviser informed the Alpha he would be blind forever, though his eyes would heal–when the Alpha sent everyone out of the room so he could be free to breakdown in peace, one of his power-hungry pack members refused to leave, thinking he could easily kill his blinded leader and become an Alpha himself. But, surprise!, the Deucalion has the ability to see whenever he’s in wolf form, and he quickly killed the mutinous pack member. 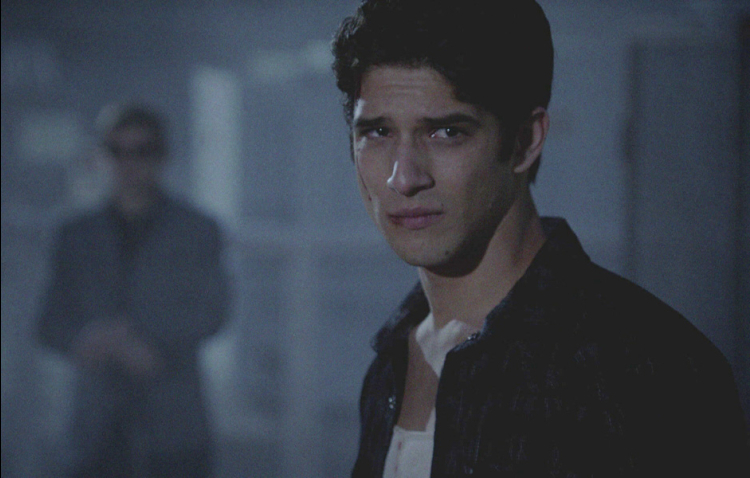 As Scott and Allison left Gerard, Scott paused for a moment to threaten Gerard’s life if it turned out he was lying, and his lies got someone killed; Derek, who’d been missing for the entire episode (his present day self, at least), returned to the sight of the werewolf ambush and found the werewolf revenge symbol Ennis had carved into the building in anger. At first glance, Teen Wolf might easily be dismissed as a corny supernatural teen drama, but, over the course of two and a half seasons, the show has proved itself to be anything but ordinary. The show has never been afraid to take stylistic or storytelling risks, and last night’s episode was nothing but a storytelling risk: a bus full of ordinary (and not-so-ordinary) high school students stop at a creepy, Bates-like motel for a night and encounter plenty of horror movie thrills, complete with phantom suicides, werewolf mind control, and spooky motel managers that take pride in their motel’s suicide record. Oh, and Alpha Derek managed to gain a girlfriend whilst lying on his deathbed (though that particular storyline felt a little off, to be honest). The episode opened with a flashback to the motel in 1977, where an injured man was checking himself in with a gun. After examining a werewolf bite on his side, the man pulled open the shades to witness the full moon. As his eyes turned gold, the man held a gun to his head and pulled the trigger. Who was the man? None other than an Argent. Self-sacrificing has been in that family for a while, apparently. Present day, the bus stops at a cheap and shady motel after their cross-country meet was pushed back a day. 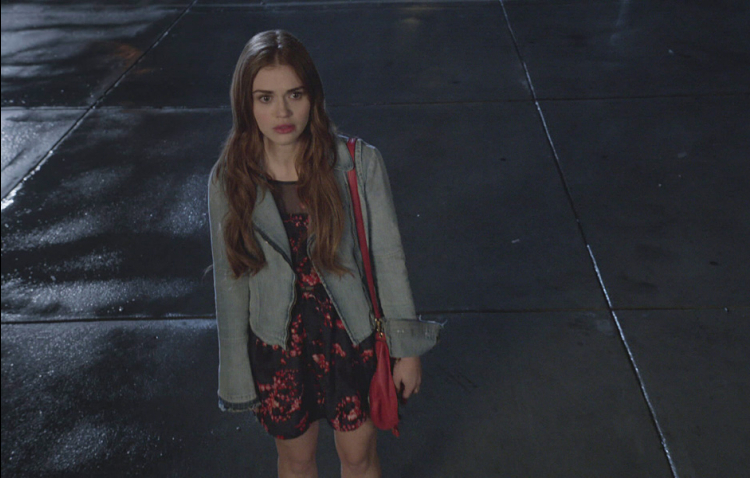 Lydia immediately gets bad vibes from the place, but Allison comforts her by saying it’s only for a night. Lydia counters with “a lot can happen in one night.” Cue credits. Sharing a room, Scott and Stiles ran through Stiles’s list of suspected murderers (the number of which had dropped from about ten to four, and Derek had been on the list twice though he’s still presumed dead by the group). Topping the list was chem teacher Harris (whose body has not yet been found), followed by Derek’s sis Cora, mysterious vet Deaton, and Lydia (because of her past mind control via Peter). 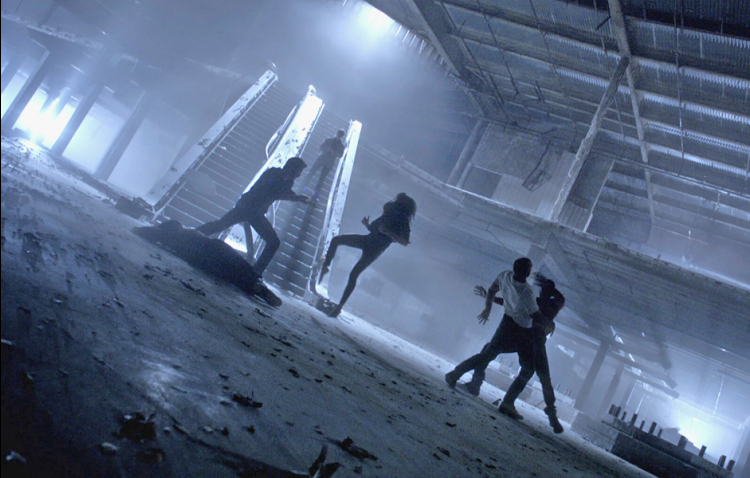 Back in Beacon Hills, Ms. Blake dragged half-dead Derek to his loft, and Mr. Argent inspected the abandoned mall where the vicious wolf fight had taken place. Looks like Allison isn’t the only one breaking her promise, though it was really only a matter of time before the Argents’ lackluster attempt to keep away from the town’s supernatural shenanigans fell through. Speaking of supernatural shenanigans, the group was only in the motel for a short period of time (but luckily long enough for Danny and Ethan to have a hot make-out sesh) before the freaky hijinks began. Stiles found Boyd staring blankly at the motel’s vending machine, and, when the machine failed, Boyd simply smashed the glass with his fist and grabbed his food. Awesome, but not normal. Scott stopped by Allison’s room whilst she was showering and spouted some weird(er than usual) junk in an apparent attempt to get back together with her, though he spent the whole exchange in a strange daze. Isaac began to hear his father’s voice in his head (remnants from a past exchange between the pair) and remembered his time spent locked in a freezer. And Ethan abandoned Danny once a HEAD tried to burst through the Alpha twin’s stomach. His solution was to hold a handsaw to his stomach, but Lydia, Allison and Stiles heard the noise and stopped him; he snapped out of his suicidal state once his hand brushed a burning heater. Lydia, who’d been plagued with hearing phantom suicides since the bus’s arrival, heard a past instance of a mother drowning her baby (this was a pretty dark episode, by the way) and realized someone in the motel was drowning. Stiles and Lydia burst into Boyd’s room (he was being haunted by his childhood past, when his sister died by falling through some ice) and found him lying underwater in the bathtub with a heavy safe holding him down. Realizing heat would wake Boyd up, Stiles ran to the bus for flares that would burn underwater, and Lydia found Isaac cowering under his motel bed. The pair saved Boyd and Isaac, then caught up with Allison to find Scott. Unfortunately, Scott had retrieved the last flare from the bus; he was holding it whilst standing in a pool of gasoline. 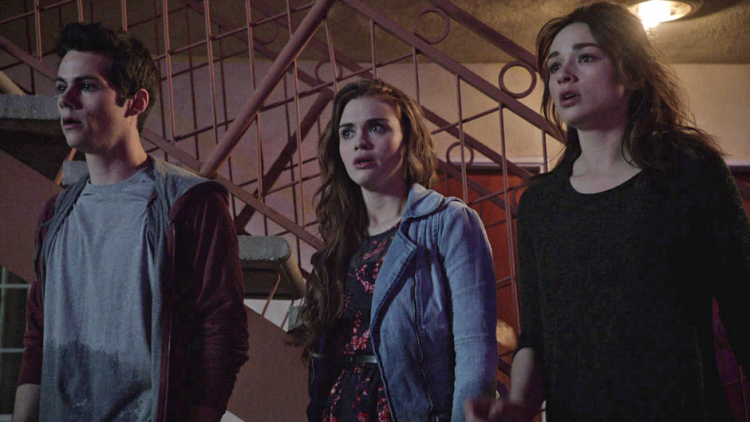 As Stiles, Allison and Lydia helplessly watched, Scott ran through the reasons why he thought he’d be better off dead, namely that he’d be nothing again (like he’d been pre-wolf bite), and his friends and family would be safe. The scene was truly heartbreaking–Scott was clearly still wrestling with the guilt over Derek’s presumed death, as well as every instance where someone he cared about or knew had been hurt or killed thanks to the wolves. Toss in his reluctance to lead a pack of teen wolves, and whatever was currently messing with the wolves’ heads, and Scott was in a seriously bad head space. Stiles managed to talk Scott down by telling him how much he needs him, how they’re more than best friends, they’re brothers, and Scott finally threw the flare away. Unfortunately, something blew the still-lit flare onto the gasoline, but Lydia tackled the boys and saved them. Looking back, she caught a glimpse of the previously-unseen big bad, a dark druid with a skeletal face and a set of dark robes, lurking in the flames. The next morning, Ethan sat by Scott on the bus and offered him some info in exchange for Scott (but really Stiles) having saved his life: the Alpha pack was pretty sure Derek was still alive, but he had killed one of their own, meaning Derek either had to join the Alpha pack or be killed. Then, Lydia noticed a black smudge on the coach’s shirt and stole his whistle; she found it was full of wolfsbane, meaning every time the coach had blown his whistle, he’d blown wolfsbane into the air and unintentionally poisoned the wolves. Stiles took the whistle and promptly threw it off the bus, much to the coach’s annoyance. Lastly, Derek spent the episode separated from everyone else, back at Beacon Hills with Ms. Blake. Their scenes mostly involved Derek trying to heal followed by plenty of kissing (during which Derek finally did heal). The scenes felt off to me simply because Ms. Blake has been handling her encounters with Derek and the wolves so strangely–rather than be suspicious or ask a lot of questions (she asked some, though seemed relatively uninterested or unconcerned with getting answers), Ms. Blake largely accepted the weirdness and gave in to her attractions to Derek, who always seems to be on the verge of death around her? I don’t know. You’d think she’d be worried or scared, but whatever. Good for you, Derek, I guess? ‘Motel California’ was definitely insane, but it was so much fun to watch, and the craziness was balanced perfectly by genuinely touching character moments (which are a Teen Wolf specialty–this show rarely skimps on character development, even with secondary characters, and the show really knows how to handle the characters’ largely-supernatural struggles in ways that feel organic rather than forced). At first, I assumed the episode was a mid-season standalone, but the show surprised me by tying in the druid’s (Lydia brought up the recent sacrifices, and reasoned that werewolf sacrifices could be next on the list–a point that was seemingly proven correct by the episode’s end); every episode this season has fit in well with fellow episodes, keeping the season moving with lovely full-circle cohesion, a feat all shows should, or do, strive for but often struggle with. Overall, Teen Wolf has a very unpredictable style–you never know what each episode will bring to the table, and, though every episode seems to be a unique piece of awesome crazy, the show clearly isn’t afraid to reach for or try different things, and it’s never shied away from doing its own thing–luckily, Teen Wolf is in great hands, and the payoff is almost always worth the show’s frequent risks. 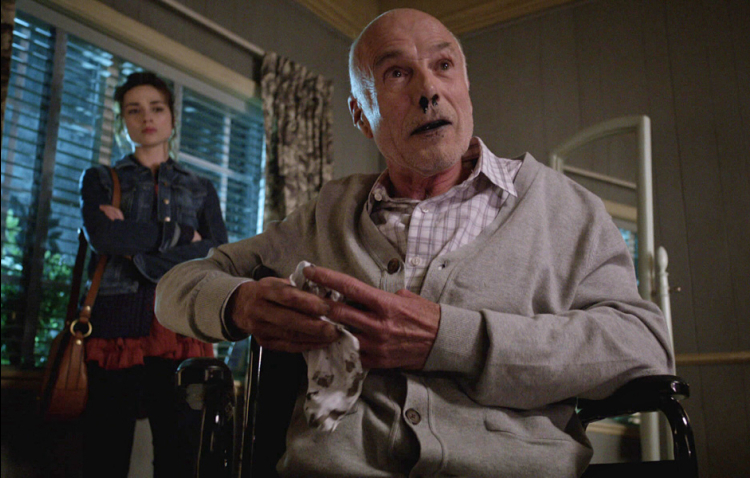 You didn’t seriously think I’d miss mentioning Grandpa Argent’s return, did you? I somehow missed Michael Hogan’s credit at the beginning of the episode, so I was completely shocked when he turned up at the end, wheelchair-bound and still bleeding black fluid through his nose. So glad he’s not dead! Mr. Argent paid him a visit to learn the name of the Alpha who’d bitten the Argent we saw at the beginning of the episode. I bet you can guess his name, but here it is anyway: Deucalion! Last night’s Teen Wolf, aptly titled “Frayed,” was a gorgeous and, at times, slightly cinematic, study of the characters we’ve come to love over the course of the show. Not only was the storyline chopped into pieces and delivered (beautifully) out-of-order, but also several of the characters found themselves unraveling to varying degrees over the course of the episode–Scott found himself in peril both mentally and physically, Isaac and Boyd struggled with their self-control and anger, Allison fought with herself as well as (both of) her parents, and Derek spent a majority of the episode missing and presumed dead. 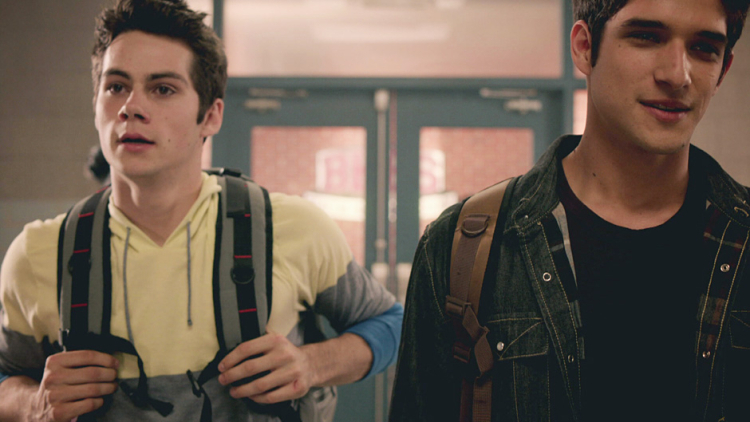 The episode opened with Scott, Stiles, Isaac, Boyd and only one of the Alpha twins, Ethan, on a bus heading toward a cross country meet. Stiles and Scott shared a confusing conversation that revealed Scott had a vicious wound on his side courtesy of an Alpha and resulted in this killer line, “I can’t believe Derek’s dead.” Um, WHAT? 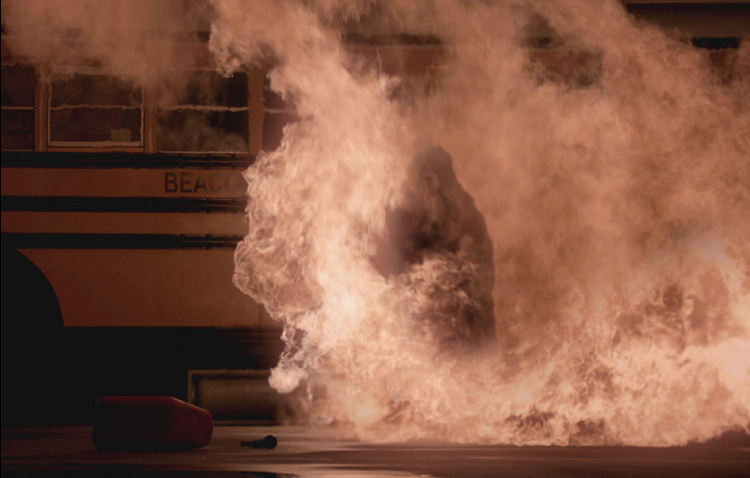 Oh, and Lydia and Allison were tailing the bus because, as revealed via partial flashback, Scott had stopped by Allison’s with one of her exploding arrows (which he found by the school) and proceeded to warn her away from getting involved with the Alpha pack. They shared a brief sparring session (after Allison insisted she could take Scott in a fight) that was loaded with sexual tension before Scott injured Allison’s wrist and left. While Scott and Alison made a good couple, I have to be honest–I’m really enjoying this new phase of their relationship. The pair aren’t romantically together, but they still care deeply about one another, enough to rush to the other’s aid whenever one of them is in danger. And they’re being very mature about the whole situation, which is a rarity on any teen show. Also, the two are growing very much as people while they’re separated–Scott’s on a path to leadership, whilst Allison’s becoming quite the badass. Anyway, post-Allison visit (and still in a flashback), Scott ran into the Deucalion in the elevator of Allison’s building; apparently the Alpha pack’s living in the penthouse suite right above the Argents’ floor. Scott ran to Derek’s and found the pack already preparing to attack, having discovered where the Alpha’s lived through Cora and Boyd’s werewolf detective skills. Also, the group planned to attack only the Deucalion, thus cutting the head off the figurative snake, though Peter made a good counterpoint by mentioning Hercules’s battle with the multiple head-spawning Hydra. The flashback then shoots a little bit ahead, right into the middle of the battle we just witnessed the pack gearing up for. Though the scene was lovely–all of the battle scenes in “Frayed” were filmed with a dreamlike quality, with a lot of dim blue lighting and tragically beautiful music (no dubstep whatsoever! )–, the battle was clearly not going well for our beloved wolf pack. Back to the present, Scott’s wound wasn’t healing and was even beginning to bleed through his shirt, though Scott was distracted from his injury by the tension between Isaac, Boyd, and Ethan. Though Scott hoped his friends would withhold from attacking on a bus full of onlookers, Boyd was looking increasingly agitated. Back to the battle, Derek is fighting one of the Alphas, and the pair fall over the edge of the floor, onto a set of escalators on the floor below. As Scott peers over the edge, he sees the fallen pair, unmoving and presumably dead, lying on the steps. Later, Peter and Cora return to the scene to retrieve Derek’s body, but both bodies have gone missing. On the bus, a delirious Scott tries to reach Boyd before he wolfs out and attacks Ethan, and, in a nicely-poignant touch, a conversation Scott had with vet Dr. Deaton plays over the moment: Scott asks the vet for advice on stopping his wayward pack, but the vet suggests a different approach and insists Scott shouldn’t stop them, but lead them. Scott does just that when he reaches Boyd, by talking him down rather than commanding him to stop. After the danger’s momentarily averted, Stiles attempts to get Danny (who’s sitting next to Ethan) to puzzle out why Ethan is checking his phone with an unnatural frequency. The pair share a funny fight via text and facial expressions, with Danny finally relenting when Stiles refuses to let the matter drop. Turns out, Ethan’s got a sick friend who’s on the verge of dying. Next thing we see, missing twin Aidan and the rest of the Alphas are dragging one of their members, the one who had fallen to his supposed death with Derek during the battle, to Dr. Deaton’s for some emergency surgery. To make the vet comply, the bitchy werewolf threatens to kill Ms. Morell. Worried about Scott, Stiles gives Lydia and Allison a call (he realized hours ago that the pair were tailing the bus, something that had escaped Scott’s notice) for help. Lydia’s solution is to get Stiles to convince the coach to pull over the bus, something the coach repeatedly refuses to do until Stiles has the bright idea to get queasy teammate Jared to vomit. The bus stops and clears out within moments, giving Lydia, Stiles, and Allison the chance to drag Scott into a rest stop bathroom. Once inside, Lydia realizes Scott’s wound isn’t healing because he’s somehow given himself a mental block. The trio’s solution is to stitch Scott up (if they can convince him that the wound’s healing, then the mental block will come down), and the task is relegated to Allison, while Lydia and Stiles leave to stall the bus from leaving. Allison’s an emotional wreck over her worry for Scott’s life, so much so that she can’t even thread the needle. Mama Argent pays her a visit and proceeds to verbally abuse Allison for her inability to complete such a simple task, but when Allison begins to truly freak out, her mother begins to calm her instead. I’m interested in seeing whether the visions of her mother are plaguing Alison psychologically, or whether they’re simply visual representations of what’s going on in Allison’s head, i.e. 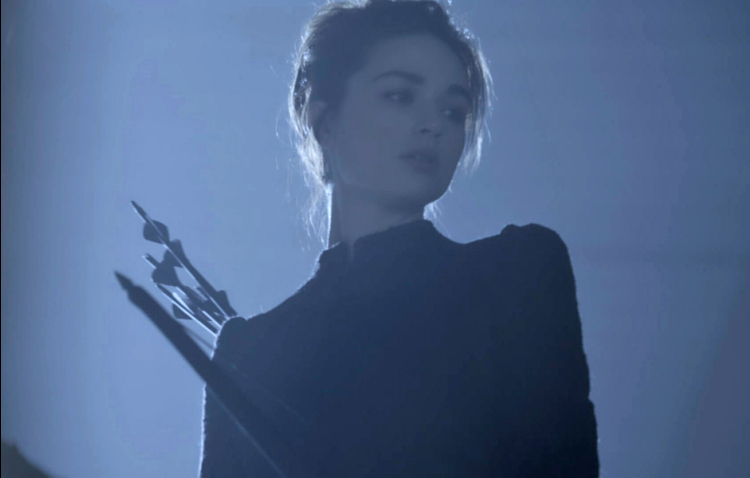 is she using the memory of her mother to motivate her, and the show’s giving us a 3D look inside Allison’s mind. Maybe it’s a combination of both? We’ll see. Anyway, Allison calmed down enough to thread the needle and stitch up Scott, unfortunately, Scott was no longer breathing when she finished. Luckily, Scott jerked awake and told Allison he blamed himself for Derek’s death. 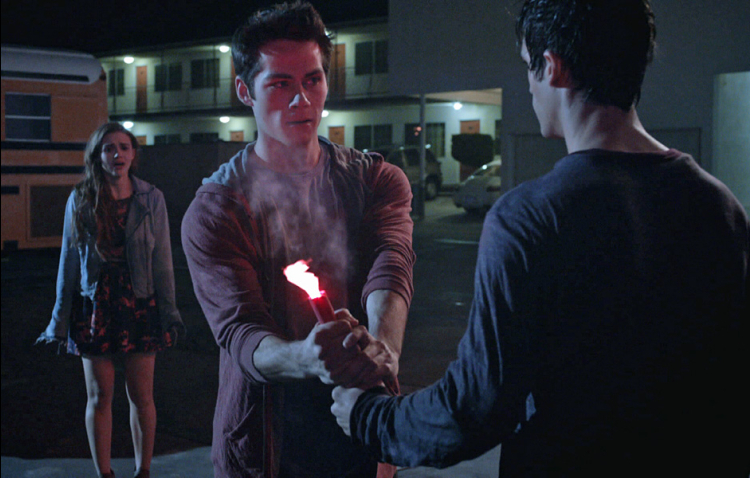 In another pre-battle flashback, Scott attempts to leave his house but Isaac refuses to allow him to go alone. The duo ride (on one motorcycle! Too cute) to the apartment building to confront the Deucalion, but they aren’t alone–Derek steps out of the shadows, along with the rest of his pack. Not to be outdone, the Deucalion calls out his own pack. The Alphas surround Scott and co., and Scott realizes Derek knew this would be Scott’s decision all along. 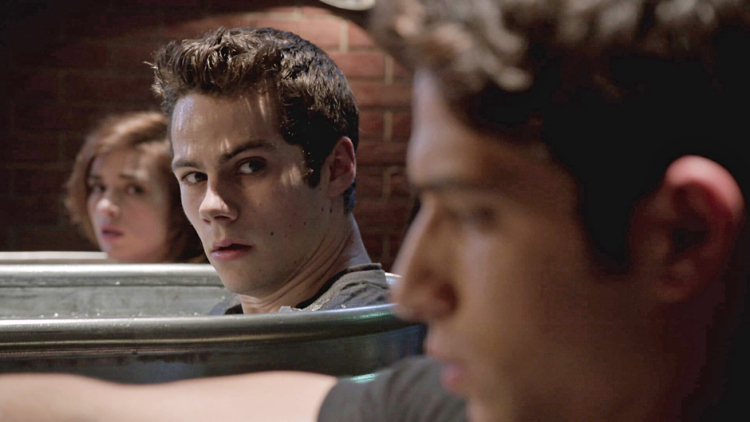 In the present, Allison helps Scott out of the bathroom, but Stiles informs them that he told Boyd and Isaac what was happening with Scott, and one of the wolves snapped. Thinking the wolf was Boyd, Scott was surprised to find Isaac attacking Ethan instead. Scott immediately stopped him by shouting his name. At the vet’s, Peter and Cora arrived and realized the entire Alpha pack was inside. Though the vet managed to save the injured Alpha, the Deucalion stopped by to crush his pack member’s skull with his bare hand. Gruesome and terrifying. A villain who’s willing to kill his own men for his personal gain is scary and very threatening, though his desire for power could also be his undoing. 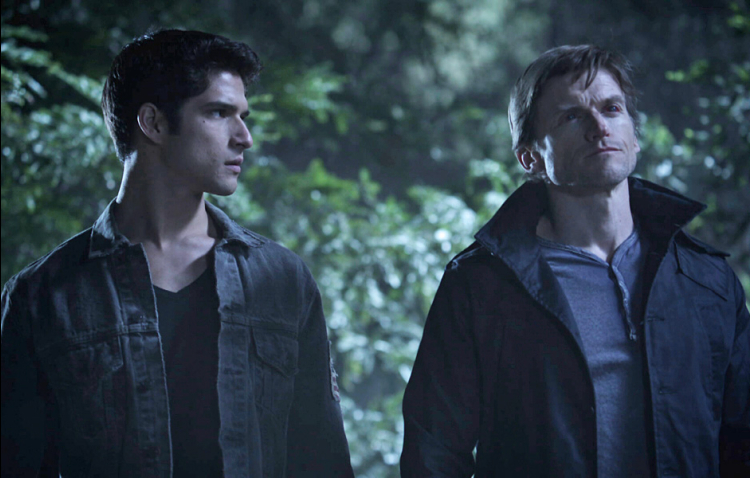 For now, the show’s simply giving him time to develop as a villain, and the tactic is working–the audience is seeing Deucalion as a real threat and a quality Big Bad, while Scott and co. are running scared and failing to fight their enemies at every turn. Also, there’s still build-up for a potentially bigger Big Bad in the human-sacrificing dark Druid. Anyway, a final flashback to the battle showed Scott and co. being defeated by the Alpha pack, until Alison showed up with her exploding arrows and saved the day. Turns out, her father had attempted to talk her out of getting involved with the wolves again, but she countered by pointing out that almost her entire family was dead, and she refused to lose her friends as well. Scott saw Allison and climbed to his feet. He attacked one of the Alphas, and the pair collided with quite a big thud. Derek stepped in and wrestled with the Alpha to the edge of the floor. 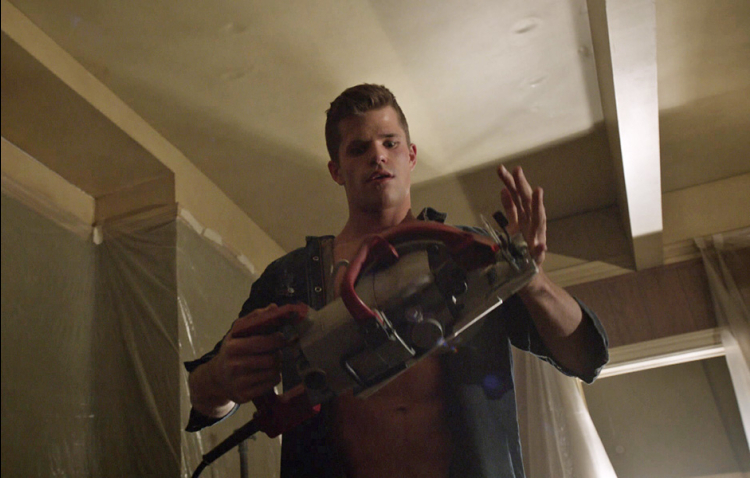 Trying to help, Scott slashed the Alpha’s leg, but the Alpha dragged Derek down with him. Thus the reason Scott’s been blaming himself for Derek’s (presumed) death. 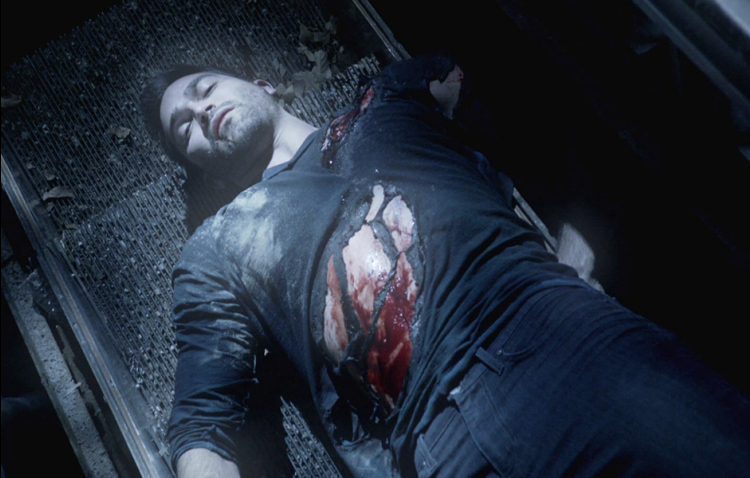 Lastly, did anyone truly believe Derek was dead? Especially after his body up and disappeared, and the Alpha was revealed to have survived the fall? Come on, a character as important and beloved as Derek wouldn’t die like that! No, Derek was alive–he wandered to English teacher Ms. Blake’s car, smacked a bloody hand print on her window and collapsed unconscious onto the pavement. A bit drama queen-y, but that seems to be Derek’s style. Oh, Derek. So, next week’s promo showed the group spending a not-so-fun night of horrific shenanigans at some motel while Derek lies on his deathbed, so that should be good! Can’t wait!